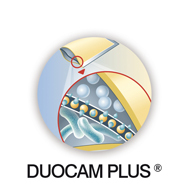 DUOCAM PLUS® is a technology allowing the separation of two different blends into the same sachet. The presence of an additional desiccant lamina ensures additional preservation of ingredients and protection from humidity. • the protection of active ingredients from deterioration. This innovative technology aims to preserve the active ingredients avoiding negative interaction between the two blends and protecting them from deterioration. DUOCAM PLUS displays an additional desicant lamina to ensure an additional protection from humidity. The technology is useful to maintain probiotic stability in order to avoid loss of Viability during storage and to permit the administration within other synergic ingredients for an enhanced effect.